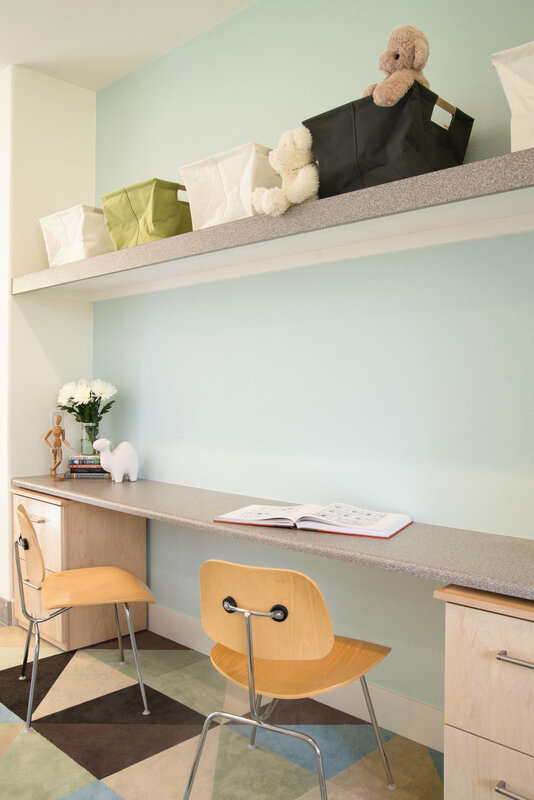 A playroom for school-aged children is designed with long-term flexibility in mind - perfect for future tween and teen years to come. 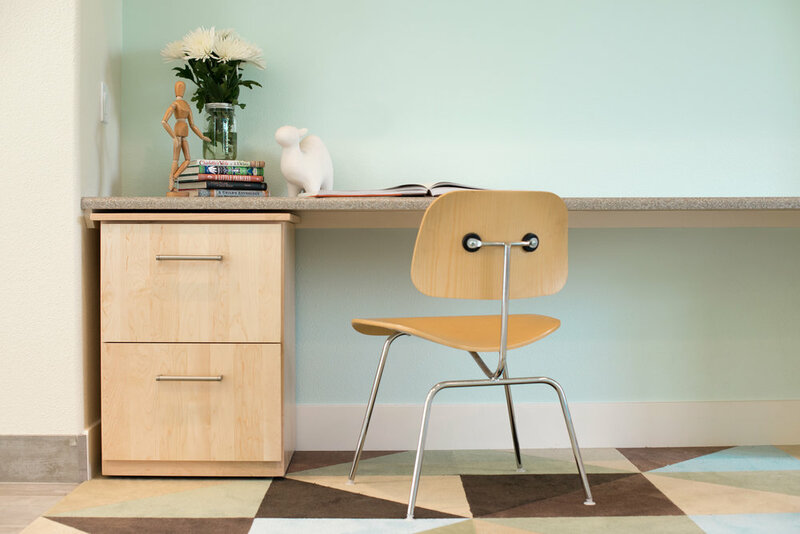 FLOR carpet tiles cut on the bias create a kaleidoscope effect and set the tone for a fun, easy going space. Easy to maintain and to recycle, these tiles handle heavy traffic and rough-housing beautifully. 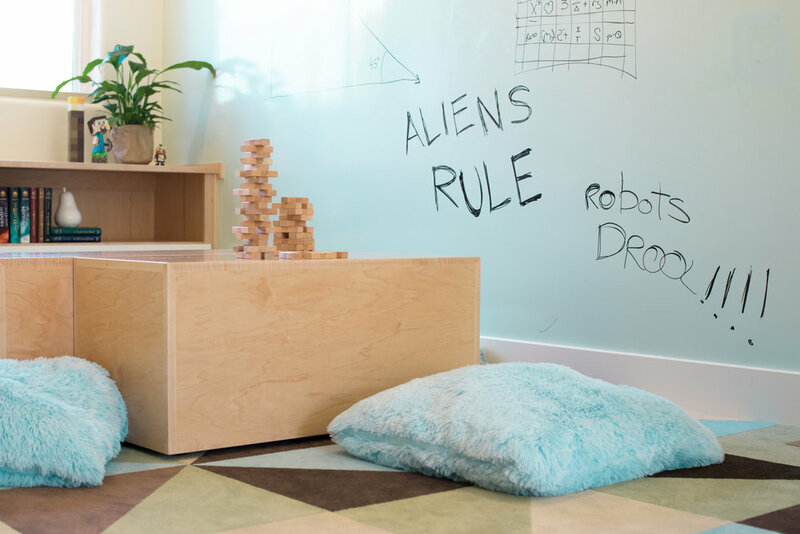 A "graffiti wall" acts as a giant dry-erase board perfect for practicing spelling words now and physics homework later on. While across the room custom file cabinets beneath the model building counter store Lego directions, art supplies and lost game pieces but later can be rolled to individual rooms for personal filing. And art wires are the perfect place for a little showing off. Continuing the custom designed case goods are cabinetry with equal parts open and closed storage. Rolling cubes roll together creating a perfectly square table for board games; can later roll end-to-end creating a long bench or separate in two for team games. A paddle blade ceiling fan mimics a unique mobile in its silhouette. The perfect topper for this fun space.